For more than 22 years, Matriplast has produced rigid containers, specifically for the pharmaceutical, cosmetics, industrial and commercial industries. Although Matriplast does export, 95% of its injection, blow and injection-blow moulded products remain in Bolivia. In La Paz, which is home to the company’s head office and primary, 6,500 sq. meter plant, there are198 employees running 38 moulding machines. The secondary 1,200 sq. meter plant in Santa Cruz has fourmoulding machines and 15 employees. The 1,000 sq.meter warehouse in Cochabamba has 3 employees. Since its inception 22 years ago, Matriplast has been relying exclusively on an in-house, ERP-type system that had been developed internally. Because its many subsystems couldn’t share information, senior executives and managers generally had to wait at least one month for financial and operational reports. As well, employees at all levels spent far too much time manually transferring information and the process tended to be error-prone. Well aware of their system’s deficiencies, Matriplast had spent the past six years in search of a Spanish-language, plastics-specific ERP. Unable to find a product that met their unique needs, as a last resort, the company tried HansaWorld and SAP but soon realized their in-house ERP was better than either one. 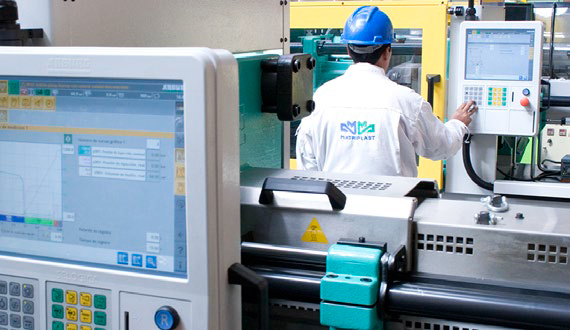 In view of its experience with generic ERP systems, Matriplast leaders knew they needed a plastics-specific ERP that could handle the many unique aspects of the plastics industry and CyFrame delivered exactly that. In addition, CyFrame agreed to create its first-ever Spanish language version for Matriplast. In June 2013, Matriplast and CyFrame started working together to install CyFrame’s complete ERP solution which included Financial Management, Inventory and Purchasing, Production and Distribution as well as real-time shop floor bar-code touch screen data acquisition. First and foremost, Matriplast can now access accurate, current data and create reports in real-time to profitably run its business and better satisfy customers. In addition, senior executives, managers, and operators appreciate the fact they can now devote all of their time and energy to the tasks that enhance margins and better manage operations.